Fales succeeding in posting the highest overall quarterback grade of the week, thanks primarily to his outstanding deep passing. He completed 3-of-4 deep shots for 128 yards and a score, and also posted a perfect passer rating of 158.3 when facing pressure in the pocket. 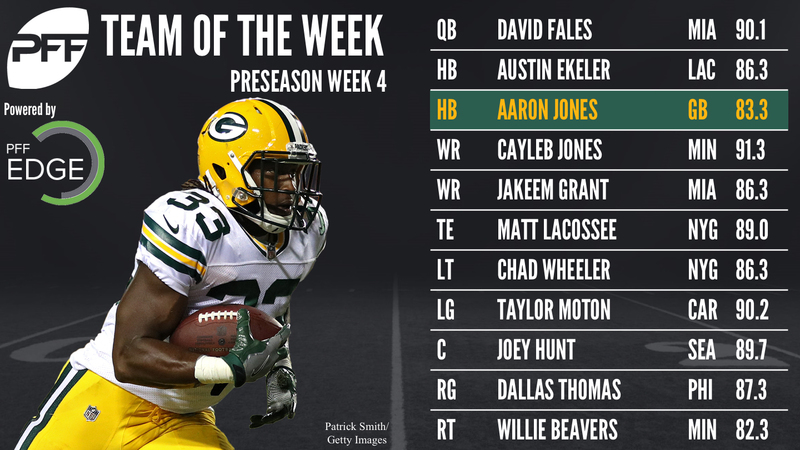 Ekeler had notched just seven carries this preseason before Thursday night, but made the most of his slightly-increased week four workload. He tallied 50 yards on eight carries, averaging 4.3 yards after contact per attempt and forcing an impressive four missed tackles. Jones’ stat line was almost identical to Ekeler’s as he too forced four missed tackles on eight carries on his way to 48 yards rushing. He also scored on a one-yard reception, and caught all six targets thrown his way this preseason. After posting just three grabs for 26 yards through three preseason games, Jones exploded Thursday night for nine catches (on 10 targets) for 127 yards. Vikings QBs had a rating of 152.1 when throwing to him, the second-highest mark of the week. Grant finished just behind Jones with a passer rating of 149.3 on his targets, and led all receivers with 141 yards receiving on four grabs. While a drop prevented him from earning the top grade of the week, he did also manage to score for the Dolphins. LaCosse had as many receptions Thursday night as he did the rest of the preseason combined (five), and his 60 yards ranked second among tight ends this week. While he only earned an average of 0.6 yards after the catch, he was the only offensive skill player to score twice. Wheeler was the highest-graded left tackle this week due to a balanced performance. Not only did he perform well on run blocks, but he also did not surrender a pressure on 35 pass block reps.
Moton did give up a hit in pass protection, but his 90.4 run-blocking grade was tops among all guards this week. On 99 pass block reps this preseason, the rookie did not yield a sack and gave up just three total pressures. Hunt was impressive in pass protection for Seattle on Thursday night, handling himself on 29 pass protection snaps, not allowing a single pressure on Seahawks quarterbacks. After back-to-back rough run-blocking outings in weeks two and three, Thomas was excellent, posting a run-blocking grade of 88.4. He also did not give up a pressure for the third straight game, and cumulatively surrendered just one on 93 pass block reps this preseason. Beavers had easily his best game of the preseason, as he was charged with just one hurry, earning a pass-blocking grade of 85.0. His run-blocking was still average (72.3), but his performance should be seen as encouraging considering the five total pressures he gave up in week three. 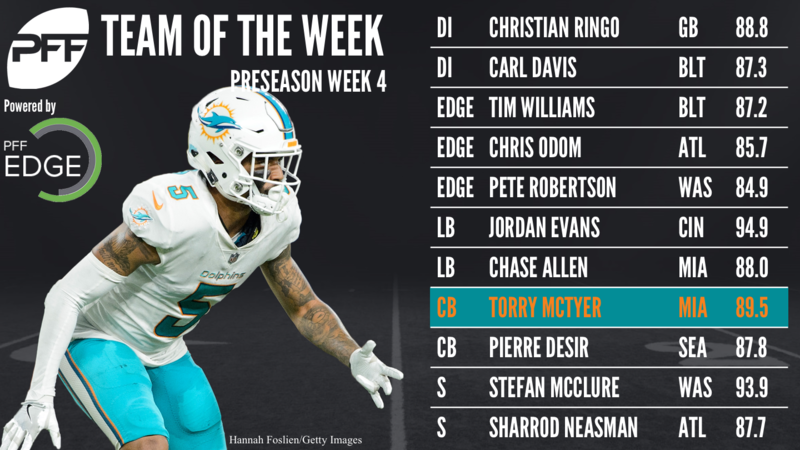 Ringo has been a strong performer throughout the preseason, and saved his best for last by racking up four hurries against the Rams on Thursday night. While he didn’t tally any run stops, he still caused problems in the backfield with his ability to defeat blockers at the line of scrimmage. Davis was a terror on pass-rushes this week, as he batted down a pass at the line of scrimmage and posted three total pressures. For the preseason, he put up a total of eight pressures and two batted passes. Davis wasn’t the only Raven pass-rusher to have a big outing, as the Williams notched two hits and three hurries. What also has to excite the Baltimore coaching staff is the fact he had success on both sides, as two pressures came on rushes from the left and the remaining three came from the right. Odom put together possibly the best run defense performance of the preseason, as he posted eight run stops and easily led all defensive ends in run stop percentage (21.6 percent). He also posted a sack, two hurries and a batted pass, and had a total of nine solo tackles, six assists and nine defensive stops for the game. Robertson’s run defense grade was hurt by a missed tackle, but his outstanding performance on pass-rushes earned him a spot on this week’s team. He tallied three QB hits and five hurries, and led all 3-4 outside linebackers in pass-rush productivity. Evans’ grade represents the highest individual overall mark of the week, and he accomplished this in just 18 total snaps. He racked up six solo tackles, all of them going for stops. He also limited receivers to two catches for one total yard on four throws into his coverage, with both incompletions coming due to him breaking up passes. Allen led all off-ball linebackers with a run defense grade of 91.4 this week, thanks in large part to his seven solo tackles and two assists. He led all inside backers with five run stops, and was also at the top of the heap in run stop percentage (20.0 percent). McTyer was outstanding in coverage, as the only reception he gave up in four targets into his coverage went for just three yards. He broke up two passes, his only ones of the preseason. Desir was targeted seven times by the Raiders on Thursday, and he was clearly up to the challenge. He surrendered just two receptions for 28 yards, and gave up just one yard after the catch. He also broke up a pass, and his 40.3 QB rating against finished fourth among corners that faced at least 15 targets into their coverage in preseason. McClure posted four total defensive stops on Thursday, and was excellent in coverage. While he surrendered three receptions, they went for a total of one yard, and he also broke up a pass. Neasman also posted four defensive stops this week, and racked up five for the preseason without missing a tackle. He also picked off a tipped pass in the end zone, the third of the day for the Falcons. McManus was an easy choice this week, as all six kickoffs went for touchbacks, and he was a perfect 3-for-3 on field goals. He finished the preseason a perfect 10-for-10, including two over 50 yards. Anger put together a strong outing, as his net of 44.0 yards on five punts was fourth-best among punters with at least four attempts this week. Only one of his attempts was returned (for a gain of eight yards), and he buried three inside the 20 yard line. Chesson had a monster game, as he averaged 29.5 yards on two kick returns and returned a punt 76 yards for a touchdown. With speculation existing that Tyreek Hill may surrender return duties this year in Kansas City, Chesson may have won a job with his performance on Thursday.